Accuweigh manufactures a range of digital bench scales designed as robust, general purpose industrial scales for use in a wide variety of weighing applications. 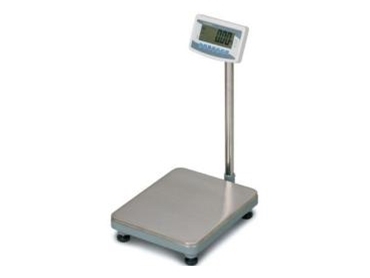 Available at Accuweigh branches in all states, the Avery AWB-120 digital bench scales feature a die cast aluminium base for strength and durability without the extra weight of cheaper cast iron bases used in conventional machines. A stainless steel shroud covers the weighing platform to provide an extremely hard-wearing but easy-to-clean weighing surface. The Avery AWB-120 digital bench scales can also perform basic checkweighing and totalising tasks, making them suitable for use in shipping, despatch and dry food weighing applications. A highlight of the AWB digital bench scale design is the huge 52mm high digits used in the LCD display with configurable backlighting to ensure clear weight readings under all lighting conditions. The display is mounted on a strong stainless steel pole to cater for the occasional knocks and bumps received by bench scales during their daily use. The Avery AWB-120 digital bench scales are powered by an external plug-pack in addition to an internal rechargeable battery, making them suitable for diverse applications including mobile weighing duties. Accuweigh is a leading Australian industrial weighing equipment company with eight branches across the country providing sales and service support on all digital scales and weighing equipment.